Day two in the Smoky Mountains began with lunch. We started to drive towards The Parkway which is where all the attractions are in Gatlinburg when J said she sort of wanted breakfast. 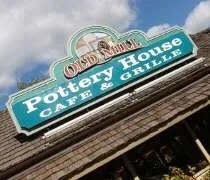 Had I continued the way I was going, we would have ran into about a dozen different pancake houses, but as we were driving on Dollywood Lane, I saw a sign for The Old Mill Restaurat. We headed back for the Old Mill, but when we got there, while it looked cool, the menu was too “old lady-ish” according to J. I could have found something to eat, but it didn’t do much for me either. Instead of getting in the car, we started walking around the Old Mill District which has a number of cute little shops. Across the street, I saw a cafe and we found a menu that was more our style. 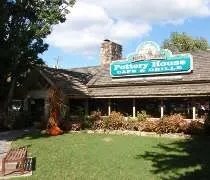 The Pottery House Cafe and Grill sits on Old Mill Street in Pigeon Forge’s Old Mill District. The whole area is cute and sort of rustic and The Pottery House fits that style. The restaurant is off the road a little bit, but they put menus out near the sidewalk. We liked what we saw so we walked up. When you enter the restaurant, you come to the cashier station right away and walk down a little walkway to the hostess stand. The hostess asked if we wanted to sit inside or on the patio. Since it was a nice day, we chose the patio which was a good choice. The area is made up of wrought iron tables on a cobblestone patio. 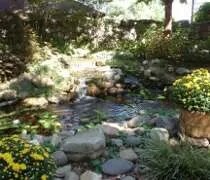 The centerpiece is a Koi Pond near the back with a little waterfall. When we sat down, we were the only ones out, but by the time we left, a number of parties had been seated with us. The waitress got us a Coke and a Sweet Tea while we looked over the menu. No surprises. Burgers, sandwiches, etc., but she tried to push their quiche which neither of us were really into. 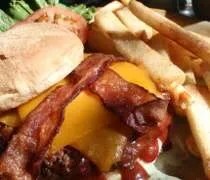 Instead, I ordered the Smokehouse Burger. I decided I was going to try to get BBQ sauce on something for every meal we eat down here. The sandwich came with grilled onions, which I left off, bacon, cheese, and BBQ sauce. It also came with a side of steak fries. The sandwich was good and not too messy. Usually I make a mess when I try to eat a burger with BBQ sauce on it. I had a little trouble, but not much. The fries were a little undercooked, but they were steak fries, so I don’t expect them to get too crispy. J ordered the Pottery House Grilled Club. 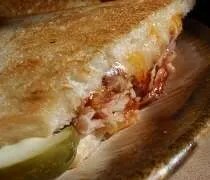 The sandwich had Black Forest ham & turkey that was grilled on Sourdough bread with cheddar-jack cheese, Old Mill BBQ sauce and mayo. It was a pressed sandwich with a lot of meat and even though it had a lot of meat, it wasn’t too much for her. The BBQ sauce and mayo sounds like an awful combination to me, but she left the mayo off, so I could try it. The sandwich was delicious. Her meal also came with fries. Neither of us were able to finish everything on our plates. There was so much food. Our bill was a little over $23 again which seems to be the average price for a meal down here. We’re in a tourist town, so I’m not complaining. I should have known that when I got there. We didn’t go looking for the Pottery House Cafe & Grill but I’m glad we found. It’s a neat little place with a magnificent outdoor patio….and the food was good too. They make their own bread AND their own plates. How many places have you been to that can say that?